With Xbox Live and Playstation Network, online games are both fun and challenging. You can play with friends of choice or have the online network choose an opponent for you. There is a simple ranking system which you can learn more about here. However, there are more ways to get involved online than just play 1v1 matches with other players. Head to head matches and the other four online game modes available in FIFA 11 are explained below. 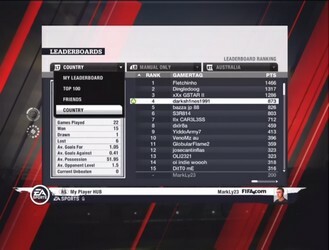 The ranking system in FIFA 11 is basted on a point scale, with points being rewarded after games not only in consideration with whether you won or lost, but also how you performed overall. Below is a list of all the factors which affect how many points you are rewarded after the match. Below is a list of many tips you can use to win more games on FIFA 11. Hopefully, these games will help you become a better FIFA player and improve your rank. If you're interested in learning about rank, look here: Ranking, but for now, here is the tip sheet. Many players don't typically use the controls offered by the D-pad, some don't even know what the D-pad is capable of doing. The D-pad is very useful, especially if you are a good tactician from watching real-life football. In FIFA 11, the D-pad has two sets of controls. The first one being quick tactics, which requires you to press up on the D-pad, and then select your tactic with whatever direction on the D-pad it is set to. There are four quick tactics to choose from and can be set to a direction from the Team Management screen of any team. 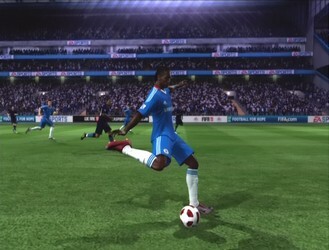 A returning feature to FIFA 11 is the choice of setting Custom Tactics. With Custom Tactics, you can make your team play exactly the way you want them to. You can expound on the advantages of a team such as Barcelona with such great passing by specifying them to play with quick, short passes and increase their build up play. You could set free form positioning to take advantage of AC Milan's abundance of players who have a high positioning stat. Most importantly, you can customize your team's settings to make them play just how you want. FIFA 11 is about as equally paced as FIFA 10, so passing is still a crucial skill to be able to do well. You must learn to posses the ball through passing before looking for that killer through ball that puts a striker in on goal and other useful techniques such as playing a ball to the winger and learning when to cross.